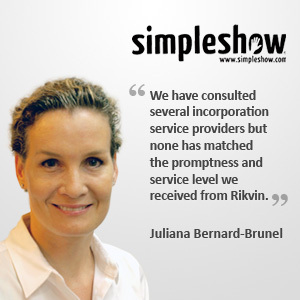 Tell us more about Simpleshow Asia. Simpleshow Asia Pte. Ltd. is looking to sell and produce a very successful ‘infotainment’ video clip format – simpleshow – throughout Asia, with Singapore as a starting point. Hundreds of clients are already using simpleshows, and the clips have been produced in over 40 languages. Simpleshows are especially suitable where complex topics need to be communicated in a clear and concise manner, and the clips can be produced for just about any business and for almost any purpose: Internal training & communications, marketing of products and services, general interest topics, etc. For more information, please see www.simpleshow.com. We view Singapore as the ideal platform to launch a business in Asia. The ecosystem is in place to help scale a business: we have the possibility to recruit a skilled team, the Asian headquarters of many of our clients are here, and last but not least the Singapore government makes it very simple to start up and finance a business. We are looking to develop the business to a reach a critical mass across Asia and to launch new initiatives in the field of education and sustainability. We got a referral from several business partners and our experience so far has been excellent. We have consulted several incorporation service providers but none has matched the promptness and service level we received from Rikvin.